Ignition Poker Mobile offers cash games and tournaments on any iOS phone or tablet. Their new mobile poker app is compatible with the Apple iPhone/iPad and they welcome players from both Australia and the United States of America. Ignition Poker is USA and Australia friendly . Works on any type iPhone, Android or Windows Phone. Both Sit & Go and Multi-Table Tournaments available. Texas Hold’em, Omaha Hi and Omaha Hi/Lo games. Play high-speed fast-fold or Texas Hold'em ring games. One of the busiest United States facing poker networks. Ignition Casino acquired on of the the largest US facing poker room, Bovada poker. Thankfully nothing has changed and U.S. and Australian poker players can still enjoy playing from their desktop, tablet or smartphone at Ignition. The Ignition mobile poker software works from the browser of any Android, iPad, Windows Phone or iPhone. 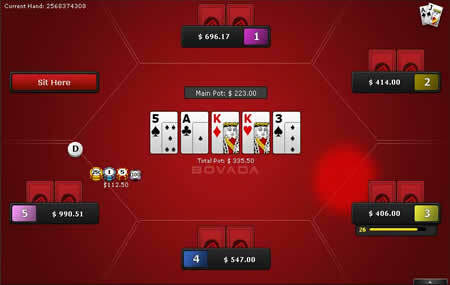 UPDATE: Bovada Poker has reopened and is once again accepting players from the United States. You can claim a pretty hefty bonus when you register with Ignition worth up to $1,000. The bonus is based around your first deposit and whatever you deposit when you have made your account will be your bonus amount. The deposit scheme will be in play from amounts deposited upwards of $10 and as soon as you start playing you will start earning towards your bonus. Each level will be paid out the following day after you have hit that level and the total accumulated will reach $1,000 should you have deposited the maximum amount. It's also worth noting that you get 60 days in which to clear your full bonus and any amount not cleared within this timescale will become void. On top of the welcome bonus you can also claim a bonus for hitting a royal flush which is worth 50 times the big blind up to a maximum of $200 and a bad beat bonus where you can claim 100 times the big blind up to $1,000 should you suffer a bad beat. Each of these bonuses are available at the dedicated tables. Ignition have decided to integrate their poker room with their sportsbook and casino section making this a multipurpose app. We actually really like this and straight from the off, the design of the app is modern and inviting. Once you've selected the poker room you then get a choice of lobbies to look at which include Texas Holdem, Omaha Hi and Omaha Hi/lo. In all honesty, this is about standard in terms of game choice, so can't really complain too much here. Before diving into the games, the lobby allows you to conduct a number of different options on your account. The button in the top right hand corner will let you view your hand history, account information and any poker bonuses that are ongoing. The bonus section is actually really handy as it works in real time, so as soon as you jump off a table you can see exactly how much you have cleared and how much you have left. 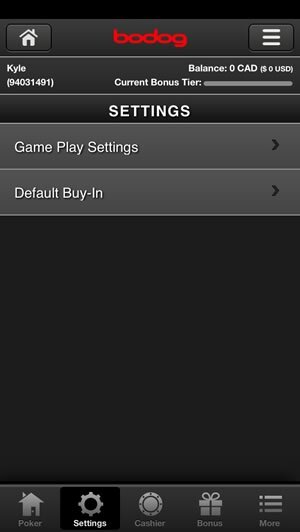 The bottom of the home page allows you to change setting for in game play. 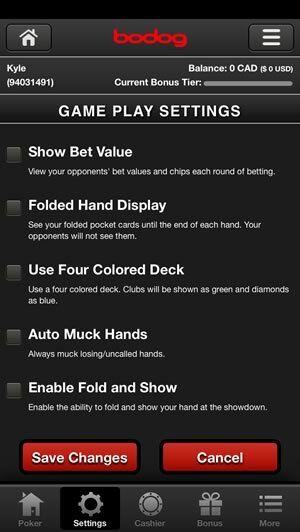 These vary, but will include show bet value, folded hand display, four coloured deck, auto muck hand and enable fold and show. It's actually a really solid range of settings here and in terms of customisation, its right up there! On top of this you get a cashier section to deposit and withdraw, another bonus section and then a 'more' button that includes contact information, game information, terms and conditions and the ability to view the full site, should you wish. 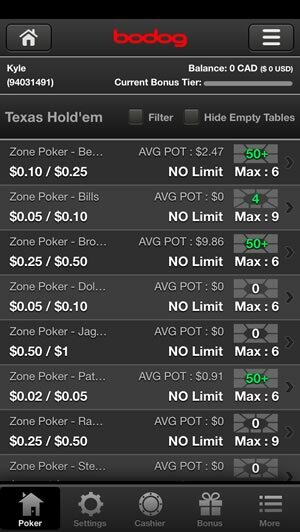 Zone Poker is one of the game formats that's on offer, which is basically Ignition's version of speed poker, that you are likely already aware of. This has its limitations due to the fact it's not everyone's cup of tea, but to be honest, it probably works as well as any on the mobile front. Traffic for the Texas Holdem games is actually quite impressive and we have seen groups of over 50 players more often than not. The Omaha variants differ but it's likely you will struggle to get any sort of game outside of peak hours. Stakes start from 2c/5c and work up to 50c/$1. If you're not a fan of speed poker then regular Texas Hold'em cash games are also on offer. ﻿The tables look absolutely stunning, especially on the high definition display of the iPhone. The red and black colours really make it look excellently designed and something that is of high quality. Even though it looks rich in design, it doesn't seem to lack in gameplay and functionality and we found games running of a reasonably solid 3G connection had no dropout issues whatsoever. You get a few options when sat at the table such as upping the amount of animations and altering the sound. We would probably recommend that if you are worried about connection dropping then just to minimise the animations as they tend to slow the whole process down anyway. Overall we though the graphics and controls worked well on the limited iPhone screen-size. We can't help but think that maybe this app was designed more for use on the iPad as switching to that device certainly gave us a lot more freedom. We have to say that this is one of the best mobile poker apps that we have come across. Everything from the design of the app to the features that are involved just makes it an all-round good egg in our opinion. We were a little concerned with the traffic numbers on the Omaha tables though, and actually couldn’t get a decent game going to test it out properly. If you are looking to sit down and grind this format then Ignition might not be the best shout. If Texas Holdem is your thing then we were inundated with games running around the clock. On top of that, the games that were running had healthy player numbers, and as mentioned earlier, some had over 50 playing at any one time. Overall there's not a lot to dislike from the Ignition iPhone app. They have a few niggles, like every mobile poker app, but we can see this being a big hit with its massive player base in the United States of America. 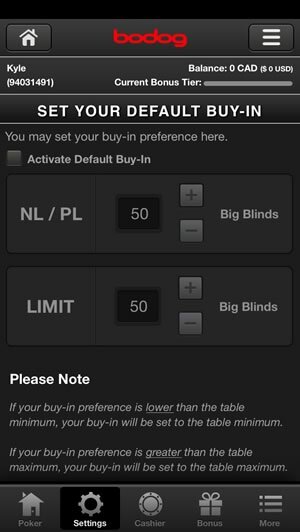 Reviews of other recommended iOS poker apps.